It's the middle of the twenty-first century, the oil has run out, economies have collapsed, people are living in trailers stacked on top of each other, and the virtual reality known as OASIS is an attractive place for lots of people, including Wade Watts, his fellow students, and gamer friends. Oasis was the brainchild of James Halliday, a genius game designer with an obsession for 80s pop culture who built Oasis to encompass all the aspects of personal relationships we now conduct through the internet and more, in a vast, virtual universe. 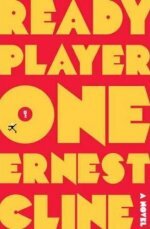 That virtual universe is where most of Ready Player One, Ernest Cline's first novel, takes place. The set-up is that when Halliday died, his will revealed a game hidden in Oasis, with cryptic clues leading to a fabulous prize; inheritance of his personal fortune, and accompanying control of Oasis. But the clues are incredibly cryptic, five years after the a worldwide frenzy of clue pondering and reference searching, no one's solved even the first clue and interest has waned. That's where Wade steps in and Ready Player One begins. The ensuing story is a virtual and real world adventure centered around the quest for the prize, with elements of teen angst and a fairly poignant coming-of-age story. Throw in enough film, book, music, and game references from the 80s to stock a long-running game show and you've got a novel guaranteed to sweep potential readers up in the sheer enjoyment and puzzle-solving mystery of it all. Those potential readers ought to include a much wider audience than gamers and fantasy role-playing enthusiasts. Ready Player One's characters may be more likely to be identified by their avatar than their real names, but they're also kids struggling to find a place in their world. If there's a weakness to Ready Player One, it's that the depiction of that world is a fairly standard, run-of-the-mill near-future scenario, although the vertical trailer parks are a nice touch. The novel actually spends only enough time in that real world to establish the desirability of getting away from it, and to furnish a compelling threat to Wade and his friends. It's in the Oasis where the story really comes to life, and that's where the characters live out their dreams, desires, mistakes, and triumphs. At its best, Ready Player One turns its characters' inner fears and innate geekiness into their greatest strength and virtues, no small accomplishment for a novel, or game, of any kind. Reviewer Greg L. Johnson has to believe that Ready Player One is a movie waiting to be made, with the caveat that the song credit rights alone could blow the entire budget. Greg's reviews have appeared in publications ranging from The Minneapolis Star-Tribune to the The New York Review of Science Fiction. And, for something different, Greg blogs about news and politics relating to outdoors issues and the environment at Thinking Outside.